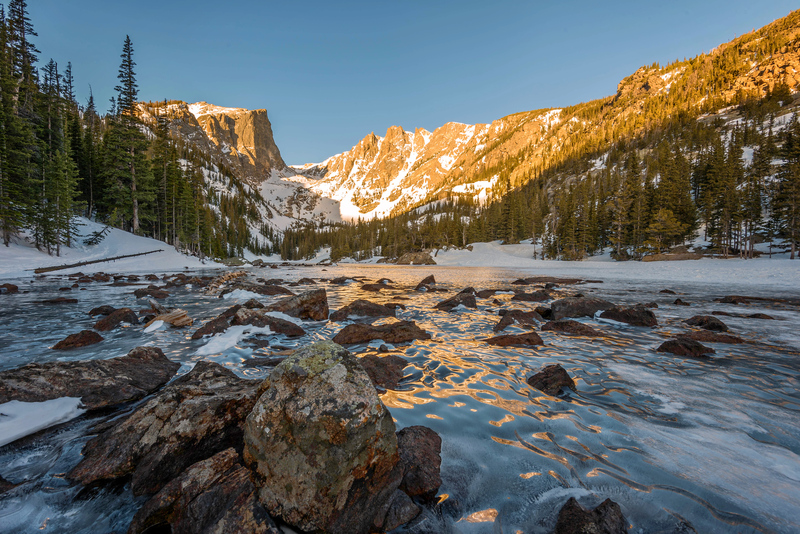 Winter in the Rockies are magical – yes any time of season can be defined as magical so what makes the winter different? For me it is the dead silence that envelopes one of our nations most populated/visited national parks. In the summer I’d probably encounter one, if not two other people, on the trails pre-dawn but in the winter….not a single soul. It is just me and the watchful eyes of the elk wondering what the hell it is that I’m doing that early when it is this damn cold!?! Regardless of the temperatures there is nothing that makes me happier than seeing the light hit the peaks as daybreaks on the Rockies. I only wish that during these trips I knew better how to use my GoPro because I would have taped it to a tree and captured the movement of the sun over the mountains as the day announces itself. I spent two mornings at Cottonball Basin in Death Valley waiting for the sun to rise. Cottonball basin was noted in an ebook I purchased before the trip called ‘Desert Paradise: The Landscape Photographer’s Guide to Death Valley National Park’ by Sarah Marino and Ron Coscorrosa as being among the best locations to watch the sunrise in the park. The unique salt flat shapes that form periodically throughout the year and the mountains that surround the basin on all sides make it highly photographic. However, the area is fragile so it is important to be sure that you leave no trace while hiking there so you need to be sure the weather conditions are right or else you may leave footprints in the mud for years to come. The authors noted they were fearful of including it in the book but that photo safari/groups had popularized the area in recent years so they did not feel like they could leave it out without the book being complete. Luckily, in my several days in the park I didn’t see a single soul down in this area. In this image it appears like the salt flat shapes may stretch forever but this was really a rather small area of the overall ‘Cottonball Basin’ which stretches for miles in all directions. Somehow these shapes shift periodically throughout the year so it is imperative to go out the day before with a handheld GPS and pinpoint the location or you won’t be able to find them in the morning. Unlike other national parks the ‘trails’ in Death Valley are essentially non-existent as you are free to roam everywhere – however, this means you have to work to find unique and photographic opportunities as opposed to walking up to a well known viewpoint. Without the GPS I would have been completely lost many times out there in the desert. The Garden of the Gods Park in Colorado is located in Colorado Springs, Colorado about an hour south of Denver but a world away when it comes to the red rock formations scattered throughout the area. There are a number of relatively easy hikes (all one to three miles round trip) that I was able to knock out in half-a-day or so since they are also relatively close to one another. I’m sure there are more challenging hikes but the park is set up to really be family friendly and this would make a nice stop for someone visiting Denver and looking to get a quick day trip done (of course Estes Park – the home of Rocky Mountain National Park – is also only about 90 minutes away and I’d favor that over Garden of the Gods if I had to choose just one). Pikes Peak in the Continental Divide of the Rocky Mountain Range is visible through a rock window on the Siamese Twin trail in Garden of the Gods. A quick, well-marked trail takes you to this spot with duel rock formations with views onto the Continental Divide in the distance. Positioning yourself perfectly allows you to clearly see Pikes Peak in the distance. This was a terrific fall day in Colorado – one could really get used to living out amongst all this beauty. Each time I visit I’m really jealous of those lucky enough to live in the Denver area. I spent a calm summer morning on standing on the banks of the picturesque Lake Louise in Banff National Park. The canoes that are rented to lake visitors made for an interesting and colorful foreground. I had to wait a few minutes for a couple ‘summer lovers’ to move of the dock as they huddled in a hoodie but once they cleared the area I took a couple pictures looking up at the Fairview Mountain Range across the lake. I have a meeting in Calgary at the end of March and hope to make a weekend trip up to Banff again. The Lake Louise area is likely to be closed (closed for the winter) but many of the other sights should still be open. The view from Zabriskie Point in Death Valley of the colorful clay and mudstone Badlands in Death Valley National Park. Millions of years (nine million by the estimates that I saw) ago the area that is now Death Valley was a giant lake – these Badlands formations were once on the bottom of this lake. There was also a volcanic eruption around five million years ago that covered this rock – the hardened lava is what formed to make the dark rock in this photo. Unfortunately, the clouds in the East blocked the suns rays from providing nice contrasts on the rocks and the mountain range in the distance. However, the sky was still colorful in the pre-dawn ‘blue hour’. My flight last night to Denver got cancelled…that was a bummer but little did I know that was only the start of my adventure. American Airlines is normally fantastic! I fly them all the time for work and last year came so close to Platinum status. I’ll get there this year! However, last night the O’Hare Airport luggage department really had me in a mindf#ck situation (excuse my French). I checked my bag through to Denver and grabbed a quick bite to eat while I kept an eye on the board as I noticed that other flights – presumably due to the troubles out east – were being cancelled all over the place. I finished eating and was happy to see that my plane was still ontime and set to board at 5:15 – unfortunately at 5:10 they announced the flight was cancelled. I don’t know why it took them until five minutes before we were supposed to board to cancel the plane but whatever it happens so I got on the phone with customer service to learn that everything Chicago to Denver was booked until Friday afternoon. Realizing I wasn’t going to make my meeting tomorrow I just cancelled the whole trip and headed back downstairs to attempt to retrieve my luggage. This is where it got fun interesting idiotic (I don’t know if there is a word to describe it so let’s just go with ridiculous). BL: You haven’t reached your final destination. This bag is going to Denver. Me: No the flight was cancelled so I just decided to cancel my whole trip. BL: So you aren’t going to Denver? Me: Wait, what? I have to wait until May to get my bag? BL: Yes, we can’t give it to you until you reach your final destination. Me: But I cancelled my flight so THIS IS my final destination. BL (shows me the ticket and the baggage claim receipt – pointing to the DEN representing Denver): You see here on the ticket it lists your final destination and it says DEN for Denver. Until you make it to Denver we can’t give your bag back that is just protocol. I’m sorry I can’t help you (meanwhile she is reaching over for a pamphlet with the 800 number for me to call and file a claim) but you can call this number and you can see if they can help you. Ultimately, I wind up filing a claim with the 800 number lady 3 hours after I started this procedure at the O’Hare luggage desk. I sigh and head out to hop in a cab and head home….just as my bag pops out onto baggage claim nine. I grab the bag and get the hell out of there. I know I’m not perfect at my job and I’m sure I have some bad days but I don’t generally deal with the public. I feel like if you are representing a major airline and dealing with their customers your IQ should be greater than that of my cat Nola. She could have been as helpful as one of the three counter people at the ORD airport. Morale of the story is – if you check your bag at ORD and your flight gets cancelled you are screwed! I’d be catching a sunset similar to this right now had I made out from ORD yesterday. The weather in Estes Park looks amazing! 40s – 50s for highs and lows in the high 30s. This after three feet of fresh snow last weekend so it would have made for some glorious winter photos. Ah well – I’ll just have to see capitalize on the May trip. I was relatively ‘unlucky’ in 2013 when it came to light for taking photographs in some of the more amazing locations we traveled to (Rome, Venice, Glacier National Park, etc…). All things considered this is a pretty petty ‘complaint’ because the experience of being in those places was damn amazing so I want to be clear that this isn’t a complaint. However, I must say that there were plenty of days that I was bummed about the lack of good light and how unlucky I was. Enter my first quick trip in 2014 – San Francisco – for less than 30 hours…just enough time for one sunrise and one sunset. The day before in San Francisco was grey, overcast with the occasional light rain….the day that I spent there though was absolutely PERFECT! The sunrise was one of the best I’ve ever experienced, followed by a perfect day with 60 degree temps, blue skies and a colorful sunset. Maybe my photo luck will change in 2014!